Established in 2003 as a bespoke wedding and celebration cake business, Peggy Porschen has become an industry trendsetter with a huge following. 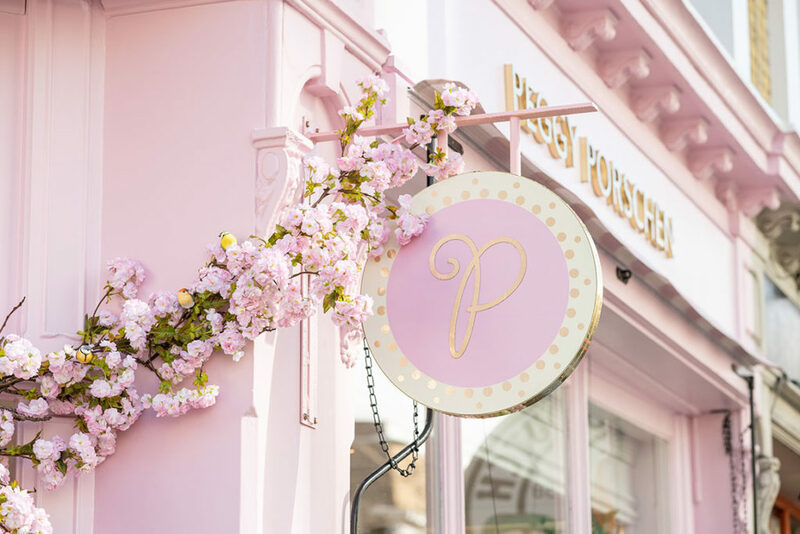 Since the brand’s first bakery opened in Belgravia in 2010, tourists and Londoners alike queue throughout the week to experience the freshly-baked delicacies – and to take a photo with its famous pink façade and seasonal floral installations. The new all-day concept marks the next step in the brand’s expansion plans. The new Chelsea Parlour consists of two floors in an attractive corner site which was formerly the Chelsea Quarter Café. 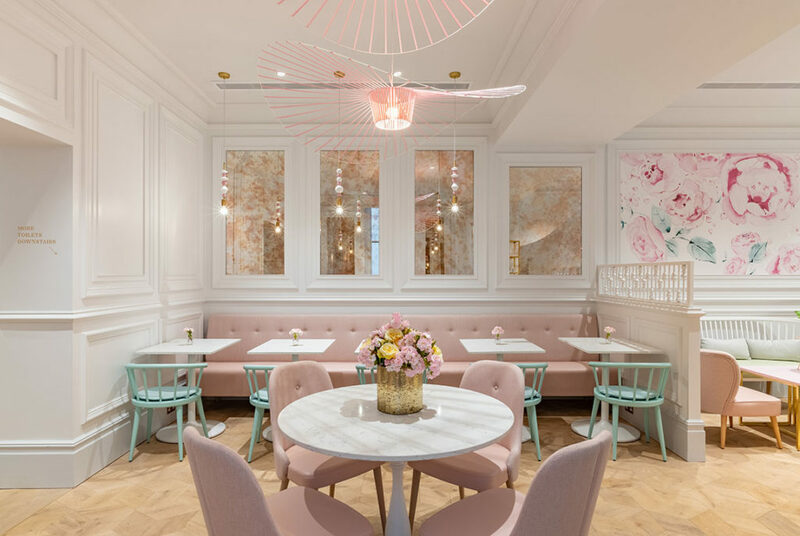 The ‘Peggy Porschen Home’ that Kinnersley Kent Design have created captures the magic and charm of the original Belgravia Parlour while adding a range of inviting new spaces and experiences. The concept features an evolved interior identity that stays true to the brand, embodying its pretty and feminine spirit through every touchpoint. The sophisticated colour and material palette is a celebration of pastels, mixing soft green, pink and blue hues. Taking a hands-on approach, the designers’ scope of work included planning, interior architecture and design, design detail, joinery design, prototyping and overseeing implementation. Several unique pieces were commissioned especially for the Parlour, including custom rose wallpaper from illustrator Kerrie Hess, whose designs have featured in Vogue, Tatler and Harper’s Bazaar. Attention to detail is at the heart of both Peggy Porschen and Kinnersley Kent Design’s creative approach. 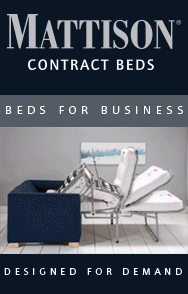 This synergy is expressed throughout the flagship, resulting in a delightful experience for customers that also responds to commercial and operational requirements. Jill Higgins, Partner at Kinnersley Kent Design, said: “Peggy Porschen is an amazing brand, with a distinct identity and a loyal following. “The design challenge was to encapsulate the brand’s essence, evolving it for the new Parlour without diluting its personality. 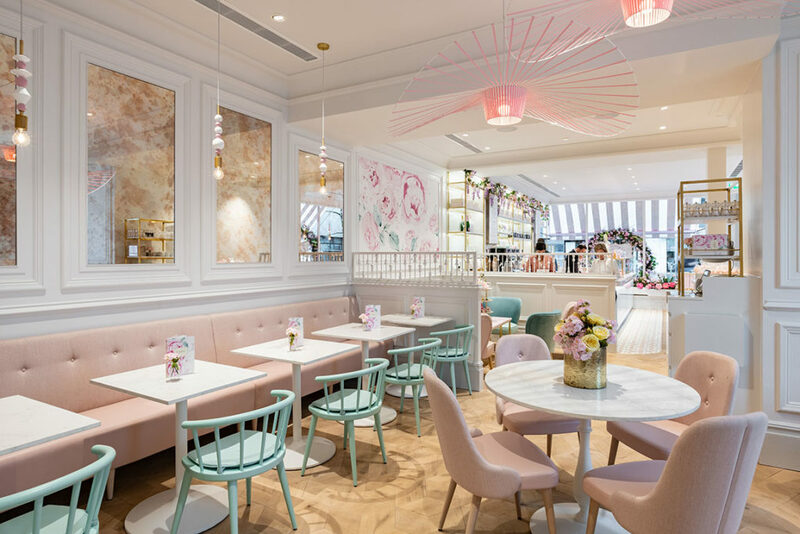 The design concept is loosely based upon the idea of a ‘Peggy Porschen Home’, each room offers customers a slightly different experience, with a change of pace and purpose. From the outset the focus was on the culinary artistry, with food as the hero. 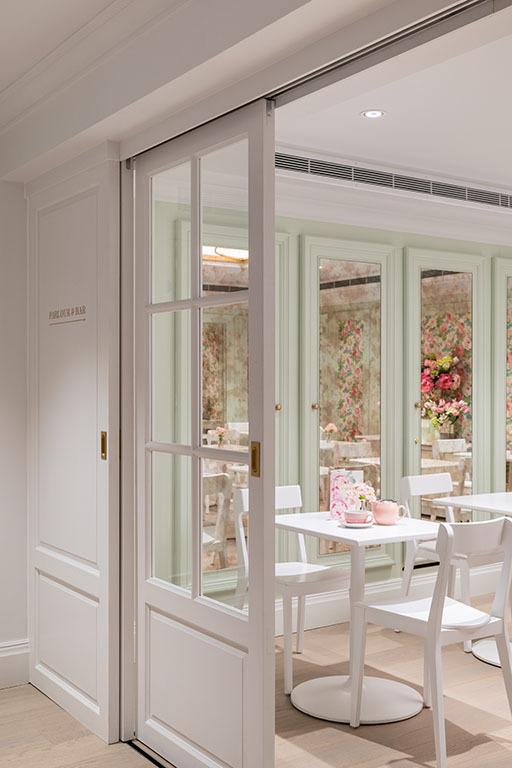 In areas where Peggy Porschen goods are displayed, such as the patisserie counter, the design elements are understated and minimal. In other areas such as the seating zones, the design is more decorative with a playful mix of traditional details and modern references. This fine-tuned approach communicates Peggy Porschen’s brand essence evenly and seamlessly throughout. The concept features a rich palette of materials and patterns, with numerous bespoke and one-off pieces. The scheme is indulgent yet accessible, combining luxurious materials like Silestone’s Calacutta marble, pastel pink terrazzo, blush antique mirror, brass detailing and a range of pastel hued velvet upholstery with more domestic materials such as painted timber wall panelling and washed hexagonal timber flooring. Kinnersley Kent Design worked closely with the client to select tableware and glassware to complement both the food and the interiors. On the exterior, Kinnersley Kent Design added brass typography to the bakery’s iconic pastel pink shopfront and bold striped awnings – a touch that’s reminiscent of classic European patisseries. The interior architecture features high ceilings with traditional plasterwork mouldings, lighting design by Fagerhult and bespoke pendant lighting by Northern Lights. Flooring is a light washed oak, laid in a hexagonal pattern to create both an authentic and contemporary look. Table tops are in a bespoke pink terrazzo by Diespeker & Co, commissioned especially for the project, while white painted timber chairs create an informal café feel. Nestled behind the ‘front room’ space is an informal lounge area. The lounge area features a specially-commissioned bespoke rose wallpaper from Australian illustrator Kerrie Hess. The large floral illustration is displayed like a painting, framed by timber wall-panelling. A further screen divides this zone from a tasteful ‘Salon de Thé’ at the rear of the ground floor. The tea salon is flanked by banquette seating and enhanced with the same rose illustration wallpaper. Two vertigo contemporary chandeliers form a central feature. In the basement is a small bar linked to an attractive events space by sliding timber-framed glass doors. This room can be transformed to host private parties or opened to form part of the main Parlour during busy periods. It acts as a grand dining room, lit by a dramatic central ‘skylight’. It is detailed with a refined decorative brass framework and a skylight that creates the impression of airy daylight, despite the basement location. 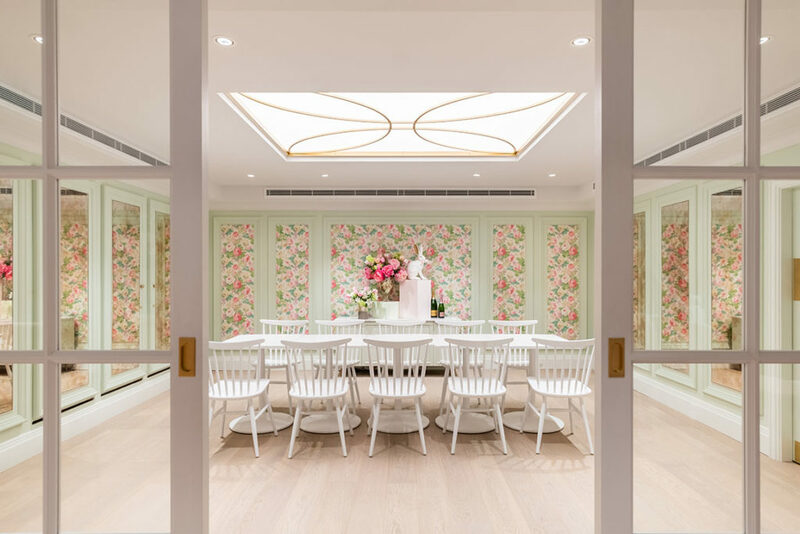 Each wall is finished in a soft pastel green panelling, with flanking walls decorated with soft pink antique mirrors, and Chelsea English floral wallpaper by Sanderson inset into the central wall opposite the doors. The powder rooms on each floor encapsulate this approach: the vision was to transform the facilities into spaces that feel as playful, pretty and feminine as the rest of the Parlour. 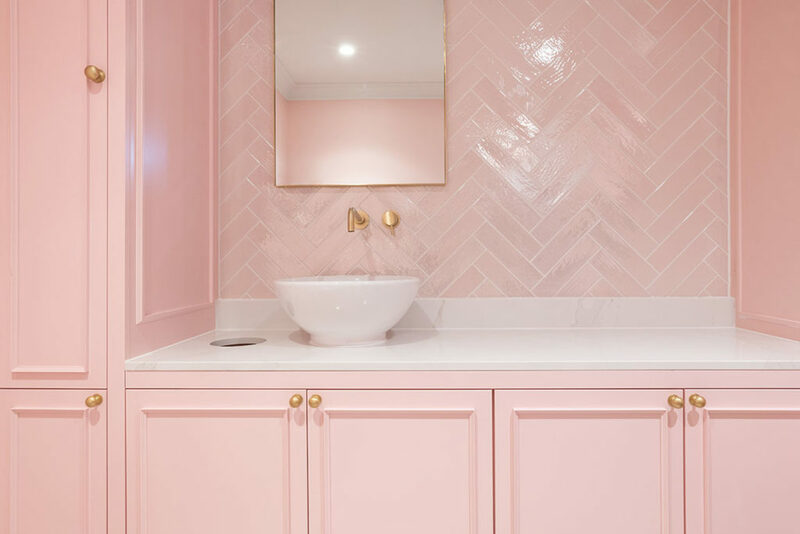 Bringing together elements of the other spaces, the rooms include bespoke ‘Peggy Pink’ striped wallpaper, pastel pink timber panelling, Calacatta marble silestone vanity tops and brass accessories, set off by pink herringbone wall tiling and pastel pink joinery. The powder rooms create the feeling of a glamorous dressing room, and a level of whimsical escapism that personifies the Peggy Porschen Parlour experience.